“Arizona is not number 1 in too many things. Education, we’re at the bottom, but in solar, we were at the top. That was good,” Arizona State University Director of Solar Energy Engineering Harvey Bryan said. Bryan has done his own research on solar trends in Arizona, and his findings match those of Environment America’s latest solar report, showing a significant drop in solar capacity from 724 megawatts added in 2013 to 246 megawatts added in 2014. 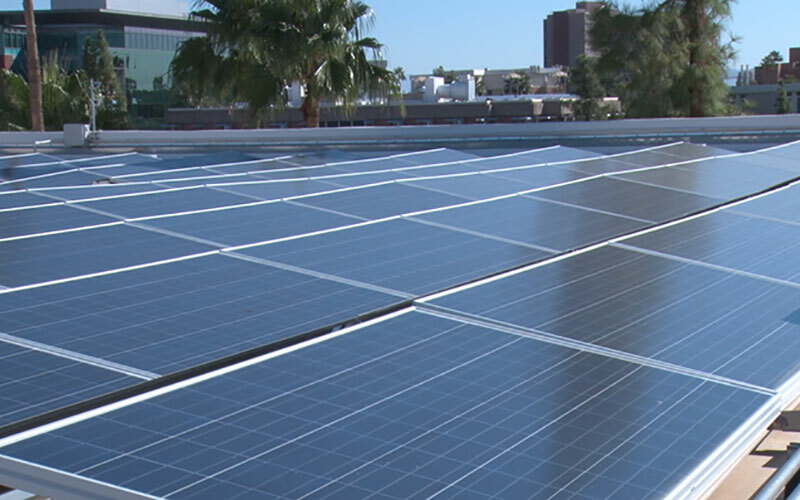 “We’ve seen Arizona Public Service as well as Salt River Project and even Tucson Electric Power are trying to find ways to increase fees on rooftop solar customers. I think ultimately they see it as a threat to their current business model, which is heavily invested in fossil fuels and big power plants,” Environment America’s Solar Program coordinator Bret Fanshaw said. Environment America is “federation of state-based, citizen-funded environmental advocacy organizations,” according to its website. However, APS says it has seen the opposite trend in its service area. “A lot of customers have been installing rooftop solar at higher levels than we’ve ever seen in our program history,” APS Director of State Affairs and Compliance Greg Bernosky said. Just a few weeks ago, APS put its latest rate proposal, an average fee increase from $5 to $21, on hold at the Corporation Commission. “Our position has consistently been that we want to make sure we’re all dealing with the same set of facts when we talk about what are the costs to serve customers via the solar, via the non-solar, any type of customer, and that has been critically important to us,” Bernosky said. “This new plan that they had was way over the top, very similar to the SRP plan and that would have really made rooftop solar in their area unaffordable,” Bryan said. Both sides in this debate say the end goal is sustainable energy; it’s just a matter of determining how everyone can benefit. Arizona ranks second, behind California, in total solar electricity capacity at 2,067 megawatts.